A brand new Bacardi Highball Long drink glasses with bat logo and Bacadi embossed down the side. Standing a impressive 16.7cm with a 6cm diameter The ultimate tall glass for your Bacardi and coke This stunning glass would enhance any bar, collection or make a super gift. Will dispatch immediately and contents will be secured safely. 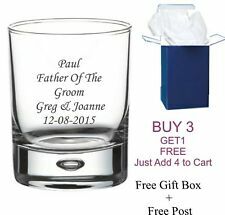 Personalised Engraved Whiskey Glass tumbler father of the bride, Groom gifts. Text colour no colour just engraved into glass. Engraved Gift For Any Occasion. 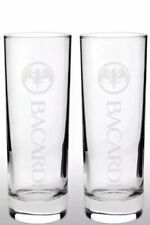 2 x Bacardi Highball Long drink glasses with bat logo and Bacadi embossed down the side. Standing a impressive 16.7cm with a 6cm diameter The ultimate tall glass for your Bacardi and coke These stunning glasses would enhance any bar, collection or make a super gift. Will dispatch immediately and contents will be secured safely. 4 x Bacardi Anejo Cuatro Glasses. Gives the perfect recipe on the box for a refreshing drink or two. 2 Bacardi Rum tall glasses 14 cms high for use with a mixer. Bacardi Rum Branded Collectors Tumbler Glass. Condition is Used. Dispatched with Royal Mail 2nd Class. Set of 3 BACARDI Glasses x2 Bat Logo x1 Limited edition. 6 Gold Rim St Germain Liqueur Mixer Hi-Ball Glasses - Used - Home Bar - Pub. Condition is Used. Dispatched with Royal Mail 2nd Class. Excellent condition but may have light surface marks in places. BACARDI GREEN HEAVY TUMBLERS x 2 (TWO). 2 X BACARDI ANEJO CUATRO GLASSES. THE BACARDI BAT LOGO IS DETAILED ON THE BASE OF THE GLASS. Unopened and unused. Ideal gift for Barcadi drinkers or glass collectors. 6 available. YOU ARE LOOKING AT BACARDI RUM & COCA COLA GLASSES. SAYS BACARDI ON ONE SIDE AND COCA COLA ON THE OTHER, PICTURE SHOWS BOTH SIDES OF THE GLASS. TOUGHENED GLASS. CAPACITY 12oz / 33cl. YOU WILL RECEIVE A FULL BOX OF 12. Collectable two (2) Bacardi Anejo Cuatro Rum glasses. Detailed Bacardi Flying Bat logo on the base of glass. About 14.5cm tall and 8cm across the top each. nd Class to 1. Stainless steel Bacardi Cocktail Shaker and glass (unbranded), there are surface marks/scratches as item is used so has signs of wear. Size - 30cl. Quantity - 1 Glass. 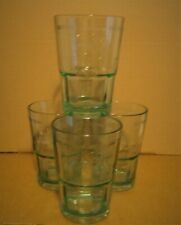 SET OF 6 UNUSED BACARDI CUATRO GLASSES. THEY ARE ALL IN BOXES. Two Bacardi & Coke highball glasses genuine Bacardi jigger. "Bacardi Coke The Original Cuba Libre" on the front. Bacardi on the back (to the line). 300ml (0.3L) each glass. Coca Cola logo on the back (to the line). BACARDI RUM. GREEN TINTED WITH BAT LOGO. Bacardi Glass. Bacardi MOJITO. 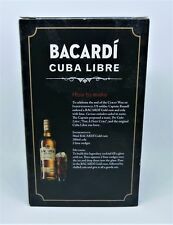 Bacardi CUBA LIBRE. Bacardi OAK & COLA. Embossed with the Bacardi text & bat logo to front. Embossed on inside rear with 4cl & fill line. Embossed on bottom with Bacardi bat logo. 2 x Bacardi Glasses. Green tinted glasses. Approx 125mmH x 78mmW @ rim. BACARDI RUM TALL GLASS 'TWIST'. To the sides are celebratory Bacardi prints; a Bacardi 150 years with logo and, a 1920’s style picture. A Limited Edition ‘Bacardi’ Rum “Go Together” Glass. Colour: Clear with a green tint. New – Boxed. 12 x Bacardi Anejo Cuatro Glasses. Two (2) Bacardi green glass tumblers (Limited Edition). Bacardi collectable set Wash before use - dishwasher safe. BACARDI CASA FUNDADA ORIGINALS 1862 RUM GLASS. THE BACARDI BAT LOGO IS DETAILED. 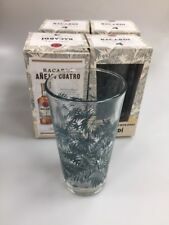 Bacardi Anejo Cuatro Rum Glasses - Set of 6 - Brand new. Condition is New. Dispatched with Royal Mail 2nd Class.